Over a dozen Nelson-area Nordic skiers recently tested their mettle in Kimberley. Jan. 12, 2016 8:00 p.m. In the dazzling sunshine and brisk East Kootenay cold, over a dozen Nelson-area Nordic skiers recently tested their mettle in Kimberley against competitors from BC, Alberta, the Yukon and Washington state, and came outlooking very strong. 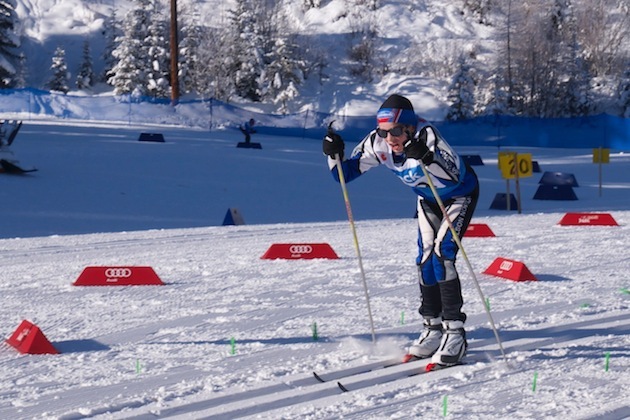 In temperatures barely reaching minus-15 degrees Celsius (the minimum permitted for racing) seven young racers, aged 6 to 15, drew on their training to give some impressive and gritty performances. In the Atom girls category, Aleah Smith brought home a second place finish in her classic race (in a field of 20 skiers), and a fourth place in the skate race. Peewee boys Kaelum Smith and Ollie Gyr earned themselves fifth and sixth places respectively (out of 15) in classic, and sixth and fourth in skate. In the Midget category Felix Barron clinched gold in the classic race and silver in the skate race. Teammate Dylan Gyr was close behind, earning silver (classic) and bronze (skate), while Rohan Moola persevered admirably through equipment difficulties to finish fifth and sixth. Ira McKimm, skiing as a Juvenile, pulled off two very impressive silver-medal finishes against national-level competition. Eight adults from Nelson Nordic Ski Club also competed. In the Masters II women’s category, Louise Poole came first in both the 20 km classic and the 15 km skate events. In the Masters II men’s category, the Nelson team owned the podium, with George Edney just edging out Kim Poole and Jay McKimm for a one-two-three finish in the 15 km skate event. In the 20 km classic race, Kim Poole and Edney came second and third respectively. Skiing in the somewhat shorter-distance recreational categories and earning chocolate medals for their efforts,were Jennie Barron (gold), Sarah Waterhouse (silver), Janet Connolly (bronze), Erik Leslie (silver), and Kurstun Smith (bronze). The Jackrabbit and Track Attack skiers sincerely thank all their coaches — especially Kaj Gyr and Roger Fontaine,for their attention and encouragement at this event — and the hard-working wax tech dads, Erik and Kurstun. The team was also grateful to Kimberley Nordic Club members, who put on a generous and delicious spread of food for the racers on both days. Racing was not the only focus of the weekend. The skiers also enjoyed snow skating, hot tubbing, and a banquet with great food and dancing. “Just hanging out together was the best part,” said one young skier. The Kimberley races were the first two of the 2016 Kootenay Cup series, sponsored by Teck. The third set of Kootenay Cup races go this Sunday in Nelson. All local Nordic skiers are warmly invited to join in the fun. To register, go to Zone4.ca and search for “Nelson Kootenay Cup.” The deadline is Friday at 8 p.m.
Below: Dylan Gyr picked up silver and bronze medals in Kimberley.